SYMAAG’s John Grayson asks why would the UK government let its commercial contractor get away with housing vulnerable asylum seekers in dangerous slums? This one-bedroom slum flat is what the UK government considers good enough for a lone parent asylum seeker from Africa, her three year old child and her baby, aged seven months. Jane’s landlord is the government contractor, G4S, the world’s largest security company. Jane’s flat wasn’t easy to find. I was directed by a neighbour through a damaged door only a few feet away from the Sheffield Supertram rails and down a dingy passage. Jane showed me exposed pipework and plugs and wires near the hole in the living room. I had already seen the back yard and the abandoned toilet area where the rats were coming from. Jane had been in the flat for three weeks. Over the previous two weeks she had been ringing G4S about the flat and the rats. After I left Jane’s flat I rang the City Council pest control team. They arrived the next day. The council instructed G4S to send their pest control contractor. They finally turned up almost three weeks after Jane’s first calls. The Home Office is obliged to provide accommodation for asylum seekers and their families while their cases are being processed. G4S, Serco and Reliance were known among asylum seekers as the companies that drove them to detention centres and locked them up. Only Reliance (which formed a joint venture with a housing company) could claim any experience of the asylum housing sector. G4S may be best known for its shambolic work on security at the London Olympics. Among asylum seekers G4S is the company that killed asylum seeker, Jimmy Mubenga. The new housing arrangements have been a shambles from day one. Over the past three years, here on openDemocracy, I have told of children exposed to health risks in rat-infested homes, lone women intimidated by their landlords, acockroach in the baby’s bottle. Jane’s flat is just one of the G4S slum properties in Sheffield that asylum seekers have shown me around over the past weeks. In a dingy terrace house in a working class suburb of Sheffield I meet Tony, a Palestinian asylum seeker who wearily tells me of his nine years being bounced in and out of immigration detention and around the asylum housing system. Since making his original asylum claim in Bristol in 2006, he has been housed in Cardiff, Plymouth, Birmingham, Peterborough, Ipswich, Nottingham, Rochdale, and a few times in Bristol. G4S staff brought him 180 miles north to Sheffield to a filthy back street terrace house. “This house is the worst they have given me in all those years,” Tony said. G4S is obliged to help Tony to travel for essential medical treatment and registration with a local GP, but that hasn’t happened. It’s a ten mile round trip from his new home to the Sheffield eye clinic. I took him there after he showed me the house. Tony told me that in the week he had been in Sheffield, “I was given a map to find advice places and I walked into the city – I had no cash for the bus”. He had to walk four miles into the city centre to a drop-in advice centre and then another four miles back to his house. Tony had no cash, only his government-issued Azure card allowing him a little over £5 a day and only useable at specified supermarkets. When I contacted Tony a few days later, G4S had brought a vacuum cleaner for Tony to clean the living room he shared with three other tenants. The day after that G4S called back and took the vacuum cleaner away. Earlier this year, at a meeting with a Home Office official, local Sheffield voluntary sector workers were given a copy of The Dial, a visual representation of the government’s strategy that treats undocumented migrants as criminals. Part of this strategy is to “Create an environment that makes it harder to enter and live illegally in the UK”. The Dial, part of the Home Office’s armoury in the fight against “immigration crime”. Balbir is an Asian asylum seeker I met in another G4S asylum property. Balbir told me that he’s been locked up in various immigration detention centres – Dover, Dungavel in Scotland, Campsfield near Oxford, and Morton Hall in Lincolnshire. “I was detained in Harmondsworth; that’s a torture centre not a detention centre,” he said. Balbir was sent to asylum housing in Sheffield – to a slum property with a history of rats and disrepair. By this time Balbir could only get out of bed with crutches and was suicidal. (He showed me scars from his self-harming). The asylum housing contract demands that when asbestos risks are discovered the Home Office and G4S immediately move people out of the property. That didn’t happen. I added my protest to G4S. The company is well aware that I write about these matters here on openDemocracy and that I help local reporters and the housing press. Balbir has since been moved to staffed accommodation suitable for his conditions, provided by a G4S specialist housing contractor. In a phone call he confirmed to me that at last he felt safe and cared for in his new accommodation. Every move of asylum seekers around detention centres and from asylum housing addresses has to be pre-authorised by the Home Office. 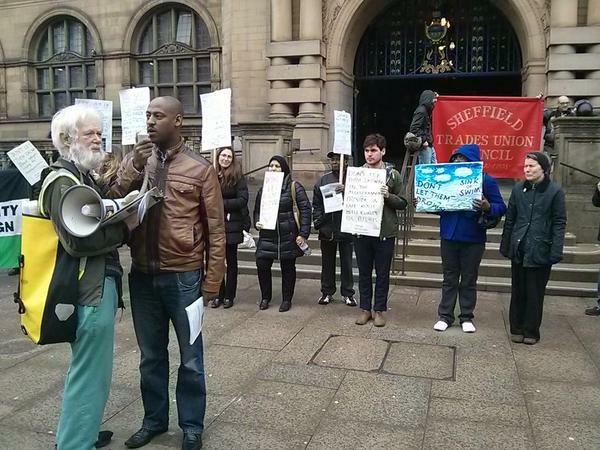 Public servants and corporate executives are complicit in exposing people to shoddy treatment around the slums of Sheffield. Outside Alan’s back yard, near the back door, Alan showed me a filthy stagnant pool. It’s not as if G4S and its subcontractor didn’t know things were this bad. Balbir had lived here. His carers had complained about the conditions, so G4S had moved him on. Alan said the men’s complaints to G4S and the subcontractor were ignored. Why not provide decent housing? My years of research and reporting, the conditions I have witnessed and the tenants I have listened to convince me that these degrading and dangerous conditions are not just a matter of incompetence and failed compassion. It’s worse than that. On paper — the G4S Home Office contract — the company is obliged to provide accommodation that meets the “Decent Homes Standard” that applies to all council and housing association homes. It’s not a hard standard to reach. A home must meet minimum safety standards. Among the obvious no-nos are broken glass, damaged asbestos, blocked drains, dampness, mould growth, rats, cockroaches. The home must be in a reasonable state of repair, have reasonably modern facilities and services, efficient heating, effective insulation. Any home that does not meet all four criteria fails the standard. So why does the Home Office allow G4S to house asylum seekers in rat-infested slums? Let’s reflect on that. If rescuing fellow human beings is a “pull factor”, is letting them drown a useful deterrent? Wood explained that the lack of detention “would act as a significant magnet and pull to families from abroad”. Letting people drown, locking up innocent children, forcing people to live in slum dwellings with cockroaches and rats, it’s all part of the same shameful game: deterrence. At the start of Refugee Week 500 Eritrean refugees marched from the International Slavery Museum to the Home Office in Liverpool . “We are asking the Home Office to be truthful about the regime in Eritrea and not just issue some report about how it is safe there. We are people who have been ruled by fear” said one of the organisers. A Home Office spokesperson, who met the protesters said: “We are dealing with fluid situations all the time. Circumstances change and that effects people around the world including the United Kingdom. “We need these type of events to enable us to review our policies” he said. We hope this protest will enable the Home Office to understand that Eritreans – who risk everything to find safety – do so for good reasons: they fear persecution and indefinite forced labour in Eritrea. 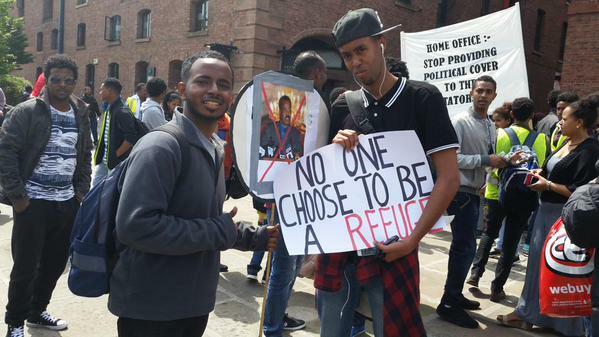 On Tuesday 16th June Eritrean refugees will march to the Home Office in Liverpool to call for justice. This march is one of a series of events planned by Eritrean refugees in the UK to combat Theresa May’s recent claim that they are in fact “economic migrants”. As part of Refugee Week there is an “Insight into Eritrea” meeting on Wednesday 17th June in Sheffield at 4pm at Theatre Delicatessen. SYMAAG has supported both events, following our Annual General Meeting where we discussed Eritrea and the Don’t Let Them Drown demonstration which involved many Eritreans in South Yorkshire. Eritrean refugees call on the Home Office to improve the country guidance reports used to assess asylum claims and ensure that people seeking safety from persecution in Eritrea are given the protection they need. Eritrean refugees from across the UK will be presenting the Home Office in Liverpool with a letter written in collaboration with Dr Gaim Kibreab calling for this discredited guidance to be taken out of the UK Government’s country guidance reports. Please join us at Merseyside Maritime Museum, Liverpool at 1.00pm marching to the Home Office, Union Street. The discredited report on Eritrea from the Danish Immigration Service (rejected by pretty much everyone except Theresa May and the Eritrean dictatorship) can be read here. According to Human Rights Watch “The Danish report seems more like a political effort to stem migration than an honest assessment of Eritrea’s human rights situation,” Key author Dr Gaim Kibreab has since disassociated himself from the published version. Since then, an exhaustive 484-page UN Commission of Inquiry report on systematic human rights abuses in Eritrea has been published which finds “systematic, widespread and gross human rights violations” in Eritrea. It also states that “a large proportion of the population is subject to forced labour and imprisonment” and helps to explain why one in ten of the entire population of Eritrea has left the country. A summary and link to the full report is here. But the UK Home Office have, since March 2015, been using a Country Guidance report on Eritrea based on already discredited information. For Eritrean refugees such reports can be a matter of life or death, influencing European governments’ policy regarding accepting them as refugees or deporting them to the country they have risked their lives escaping. Are Eritrean Refugees really “economic migrants”? It could have been ignorance which led to Theresa May recently describing people fleeing Eritrea as “economic migrants”. Or it could have been the fact that Eritreans made up about 10% of those crossing the Mediterranean to find refuge in Europe this year, according to UNHCR reports. Desperate to evade responsibility for accepting migrants crossing the Mediterranean – and make it possible to deport those already in the UK – Theresa May seeks to discover evidence that little threat of persecution exists in Eritrea. In addition to showing hostility to Eritrean asylum seekers, the UK – and other western states – have important mining interests in Eritrea. The UK’s colonial adventures and exploitation in Eritrea are not just in the past (it was, incidentally, the Yorkshire regiment of the British army that fought against the Italian colonialists for control of Eritrea’s resources in 1941). The discovery of gold, copper and zinc in Eritrea have sparked renewed contacts with the Eritrean dictatorship, along with public relations exercises by the mining companies, for example Nevsun mining PR push. Indeed ex-Conservative Party chairman (Lord) Michael Howard recently led a business delegation to Eritrea. Howard appears to be closely linked with one UK mining company Andiamo Exploration. 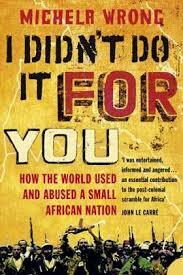 In December 2014 41 British MPs stated their opposition to the use of forced labour by mining companies in Eritrea. As well as minerals Eritrea has near endless supplies of forced labour for western mining companies as part of the country’s infamous “national service”, described as “abject slavery” by Human Rights Watch. On the pretext of imminent war with Ethiopia all Eritreans are conscripted into “national service” for an indefinite period, despite Eritrean Government claims that it is only for 18 months. The UK Government appears satisfied with a statement from an Eritrean minister to that effect as opposed to United Nations, Amnesty, Human Rights Watch reports and the testimonies of hundreds of Eritreans fleeing indefinite slavery in their country. According to the UN report on Eritrea published in June 2015: “on the pretext of defending the integrity of the State and ensuring its self-sufficiency Eritreans are subject to systems of national service and forced labour that effectively abuse, exploit and enslave them for indefinite periods of time”. 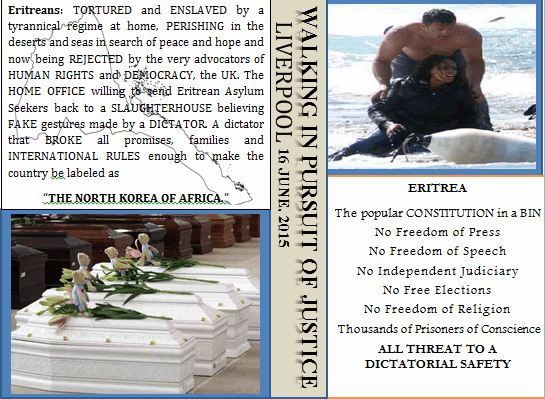 That is why Eritrean people in the UK are organising a national protest in Liverpool on Tuesday 16th June against a cynical Home Office policy. This new policy – if implemented – would abandon the UK’s commitment to the 1951 Refugee Convention which commits states to providing refuge for those with a “well-founded fear of persecution”. It would be replaced by a policy which shows more respect to racist anti-immigration sentiments and corporate mining interests than it does to the lives of Eritrean people. Come to a Refugee Week meeting in Sheffield on Wednesday 17th 4-6pm at Theatre Delicatessen, find out more and have your say. The Theatre is at 17 The Moor, Sheffield in the old Woolworths’ building. Come to hear Tesfamhret Tsegazghi from Eritrea talk about the history of the country, colonisation by the British and Italians, war and Eritrea’s fight for independence and why 1 in every 10 Eritrean people have left their country in search of safety and human rights.